1) Johnsonville TVA ECU is not responsible for the content, product, and services provided by linked sites. 2) Johnsonville TVA ECU does not guarantee the products, information or recommendations provided by linked sites. 3) Johnsonville TVA ECU is not liable for any failure of products or services advertised on those sites. 5) The linked website may provide less security than that of Johnsonville TVA ECU's website. 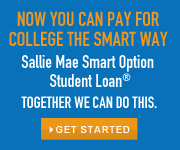 The JTVAECU Smart Option Student Loan® by Sallie Mae® is an ideal solution to help you pay for college expenses not covered by scholarships and federal loans. To learn more or to apply, please get started here. This calculator will add, subtract, multiply, and divide. *This is not a guarantee of credit. All examples are hypothetical and are for illustrative purposes only. Our calculators are for informational purposes only and are not intended to provide financial advice. This Auto Loan/Rebate Comparison calculator will compare applying your rebate to an auto loan through your Credit Union instead financing through the dealer. All examples are hypothetical and are for illustrative purposes only. Our calculators are for informational purposes only and are not intended to provide financial advice.